Lessiter Media, a publisher serving the equine, agricultural equipment and conservation tillage markets, has announced the launch of new website and event dedicated to providing farmers with practical tips and information on managing cover crops to improve their soil resource, protect the environment and enhance on-farm profitability. � The latest in on-farm and university cover crop research and industry news about suppliers, application equipment and new product releases to keep farmers up to date. � Podcasts, videos and webinars to let growers absorb valuable cover crop management information on the go, wherever they are. � Blogs that will share personal observations, market analysis and other timely information about the cover crop industry. � Opportunities to download or order special management reports to enhance cover crop learning. Beginning this spring, a weekly email update that will recap important cover crop information. 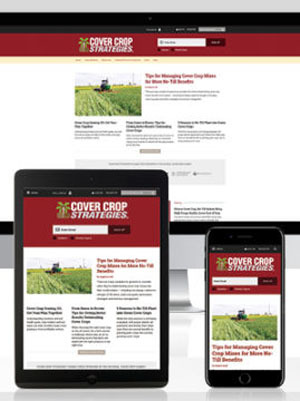 More features and enhancements to the Cover Crop Strategies website will be announced in the coming months. CoverCropStrategies.com will also function as the host website for the first-ever National Cover Crop Summit. This free online event will be held March 20-21, offering a unique online learning format through a series of educational video sessions focusing on cover crop management topic of importance for both beginner and advanced cover crop users. Several educational video sessions will go live each day, allowing registered attendees to choose the speakers and topics they're most interested in and participate at their convenience. A lineup of cover crop experts that will be presenting during the event can be found at CoverCropSummit.com. Creating the website and the Summit is "a natural for our business" as no-tillers are the undisputed leader in the use of cover crops, says Mike Lessiter, president of Lessiter Media. "We're very excited about this launch because it aligns with our mission of making a lasting difference in agriculture. "It's another new venture birthed out of the original audience - no-till farmers - that we've been working on together since my Dad put out the first edition of No-Till Farmer back in 1972." Adds No-Till Farmer editor Frank Lessiter, "Our belief is that the rest of agriculture has a great opportunity to learn from the innovation of these no-tillers. We hope our readers will help us spread the word and to connect a larger network of growers." "Lessiter Media is extremely excited to make valuable cover crop management expertise available to growers in a format that is easy to use and convenient for their busy schedules," says John Dobberstein, senior editor at No-Till Farmer. "These sessions are aimed not only at growers already seeding cover crops, but those who wish to learn more as they consider moving toward cover crop adoption." As part of this cover crop enterprise, Holtwood, Pa., no-tiller and cover crop expert Steve Groff will be working with No-Till Farmer as a presenter at the National Cover Crop Summit and serve as an advisor for the new website, which will host selected blogs, podcasts and webinars from Groff's own Cover Crop Coaching website. 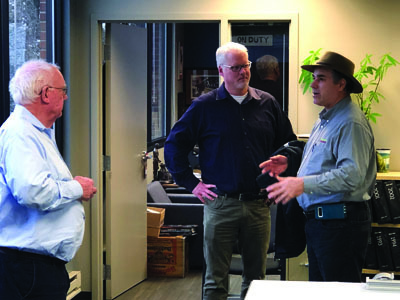 Steve Groff (right) visits the Lessiter Media office and talks about the National Cover Crop Summit with Frank Lessiter (left) and Mike Lessiter (center). The collaboration will match and leverage No-Till Farmer's content and audience development experience "to provide an even greater platform for what Steve does in his practical coaching business," says Mike Lessiter. "This effort is just like the synergy of a good cover crop mix: 1 plus 1 equals 3," says Groff, who recently led two special workshops at the National No-Tillage Conference focused on improving cover crop adoption. "We all benefit, and both organizations will be better from this relationship."